Last Thursday on September 29, 2016 Bruce Templeton launched his latest publication Twenty Four Teddy Bears: A Christmas Journey. This latest book, published by Creative Book Publishing, rounds out a trilogy for Templeton. 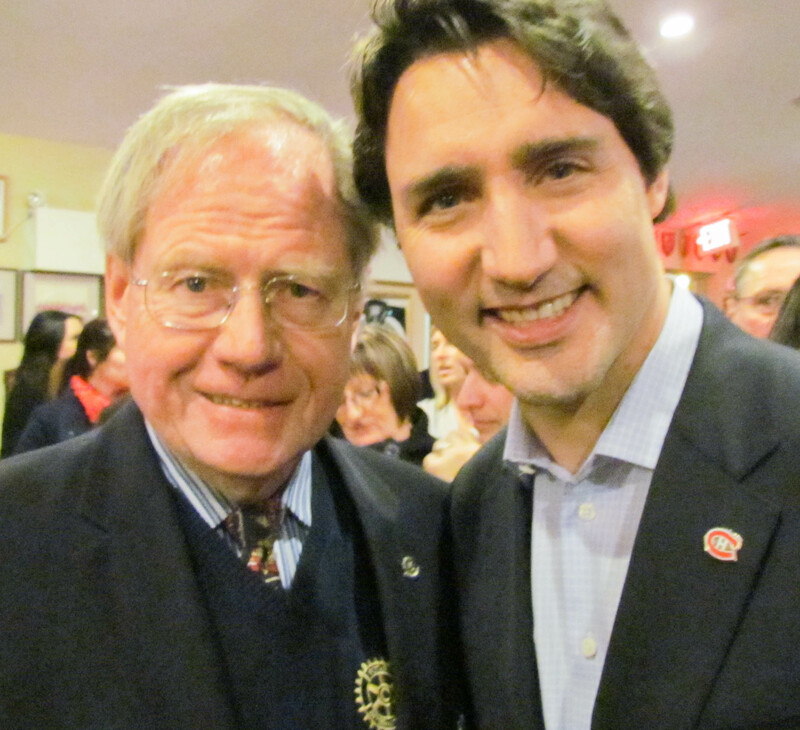 His initial release, The Man in the Red Suit, garnered international attention and was a Globe and Mail best seller. The second book in the series equaled in its success, and was called The Man with the White Beard. Like the initial two, this new book is meant to be read in the lead up to Christmas with each chapter corresponding with a date in the month. The stories profile the folks who were recipients of special teddy bears that Bruce, in his efforts as Santa’s assistant, helps get to people in Newfoundland and Labrador. If you missed the launch, take a look at this video, then be sure to visit the signings and sightings section of the website for all of Bruce’s upcoming appearances. On Thursday, September 29, 2016 Bruce Templeton launched the third book in his Christmas series that shares his experiences assisting Santa! Published by Creative Book Publishing, the book was made available for the first time ever at the event held in the Knights of Columbus hall in St. John’s, NL. As of today, you can find the book in many retailers, and online. Bruce will also be available at a number of signings and appearances, which you can find here. The Telegram’s Keith Gosse taking photos for the paper! Bruce speaking to guests at the launch. Bruce Templeton to release third book – Twenty Four Teddy Bears – September 29! Creative Book Publishing is excited to present Twenty-Four Teddy Bears: A Christmas Journey by bestselling author Bruce Templeton. Join us on Thursday, September 29, 2016 from 6pm to 8pm at the Knight of Columbus located at 49 St. Clare Avenue in St. John’s, NL, to join in the celebration. Twenty-Four Teddy Bears chronicles twenty-four of Santa’s most memorable visits over the past thirty-seven years. These have taken him from the Neonatal Intensive Care Unit to Senior’s Homes, and Santa has left the bears with tiny newborns, people who’ve passed their 100th birthday, and all kinds of children, adults, Christmas doubters, and Christmas believers in-between. Stories that will make you laugh and cry, but most importantly make you appreciate the true meaning of the holiday season. All are welcome, admission is FREE, refreshments will be served and books will be available for purchase. Visit the Facebook event page here, and feel free to invite/bring friends! Santa looked on the shelf tonight and 30 of the 48 teddies have found new arms to hold them. So 18 more visits in 10 days ending in the children’s hospital on Christmas Eve. Today was wonderful in that a very caring law firm held a big dinner for those in our city who through illness, addiction, or just plain bad luck find themselves in need this year. There was beautiful food, music, dancing and genuine warmth. Santa had a ball. The photos are from an engagement last week where Santa’s helicopter landed and he had breakfast with over 260 people. Imagine being child and you are standing on the balcony of a community centre. It is very cold and soon you hear the thump thump engine of a helicopter and Santa drops out of the sky landing in the swirling snow right before your eyes. We get one chance to keep the dream alive for children. Three more teddies have found new arms to hold them in the last 24 hours. Santa absolutely loves Buckmasters Circle and the children there. For those not familiar with the name, it is a former military base in the centre of St. John’s, NL. The children are very different. They may not have all the latest toys and clothes but do they make up for it in other more important ways. Santa went into a room packed with kids and as always, he got down on the floor. The kids climbed all over him but with great respect and kindness. But what Santa notices the most is how caring they are for one another. Older brothers and sisters with their younger siblings on their hips and looking out for their well-being. There is no fighting, just the joy of Santa’s visit and several hundred appreciative, curious, and well mannered youth who make Santa’s visit one of the nicest of the 48 Santa will do. The second teddy is with a new Canadian tonight. Thank goodness Santa has an elf to read the names of the children at Daybreak on the Boulevard. I think the wonderful staff there are as excited as the children when Santa peeked around the door and looked into the wide eyes of astonished little kids. They are all 1 to 4 years old. The children come from every corner of the world and for some, this is their first Christmas in Canada. They may not have met Santa before, but tonight there is a little two year old, with big blue glasses, curly brown hair and the biggest grin you can ever imagine clutching Santa’s teddy. Tomorrow at 8:30 am, Santa has yet another first experience here in Newfoundland. He has been asked to come to the H. Bliss Murphy Cancer Treatment Centre to be present with a little girl while she is there for her radiation treatment. Santa’s teddy will be there too and teddy and the little girl will go home together. Come with me St. Nicholas. Santa needs your guidance. Annual flight to the North Pole; 18 NL youth meet the man in the red suit! Santa had a very early start in the North Pole as a Provincial Airlines plane left St. john’s with 18 very excited children and one parent. Every child had a question that they wanted Santa to answer and the children were selected by 99.1 Hits FM. Santa is advised there were many thousand entries. You get one chance to made a memory for a child. We have kept the dream alive for 18 children who will never forget their adventure this morning. After the Flight to the North Pole, Santa went to a seniors home where family and friends gathered to meet Santa. We went into the living area where somber family sat in quiet vigil. We talked quietly as members went into the bedroom and said their goodbyes. Santa reached into his mail bag and took out teddy and gave it to a family member who hugged it. As I got ready to leave, a woman said that they would take teddy into the bedroom. They thanked Santa for coming. So a morning with 18 children on a plane and now in a unit where a soul is departing. And only half of Santa’s day is done. 75 children are next. Five teddies in new children’s arms tonight. We started the morning early with breakfast for several hundred staff members at Eastern Health. Then at noon, Santa found a wonderful daycare with some sweet young children. But the highlight of the day was Santa’s visit to Ronald McDonald House and sitting on the floor with a house full of kids reading the Night Before Christmas. A Little girl in a wheelchair has Teddy and promises to look after him forever. Santa joined Buddy the Puffin at center ice and we collected thousands and thousands of teddy bears at the hockey game. Another busy day tomorrow and we start with “the Flight to the North Pole” at 6am. 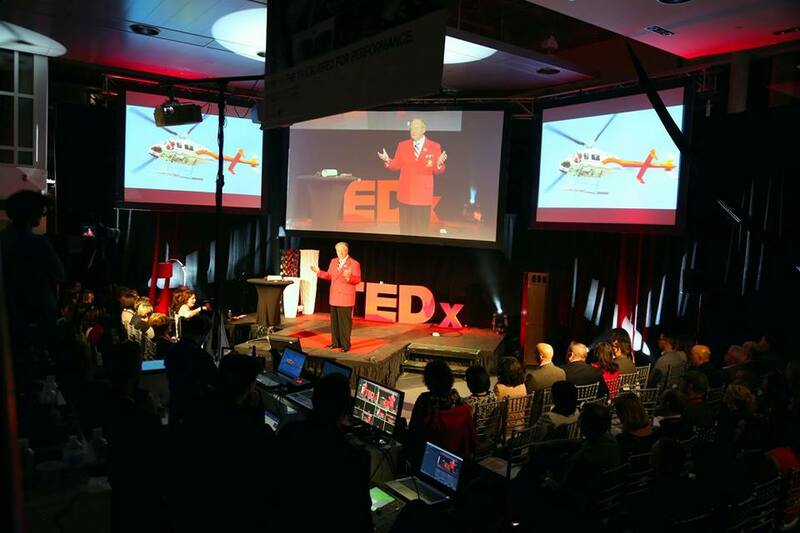 Templeton at TEDx a success! 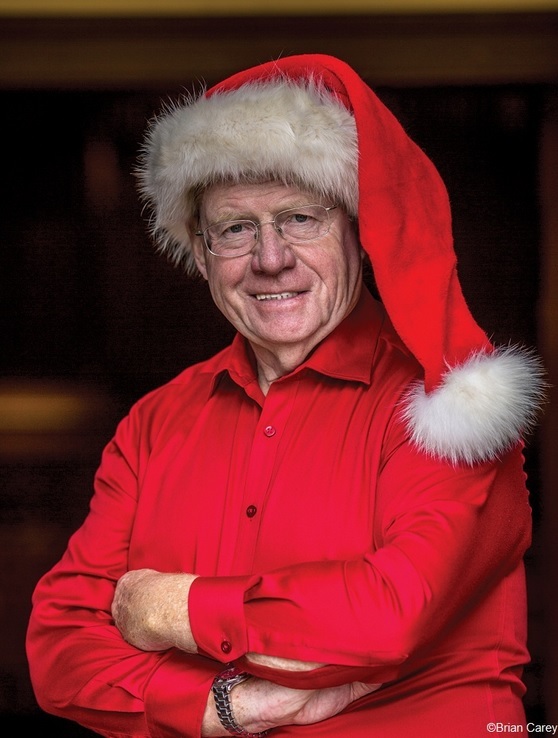 We previously shared the news that author of The Man in the Red Suit and The Man with the White Beard, Bruce Templeton, would be sharing some words of wisdom at the May 22 TEDx event in St. John’s, NL. There will be video footage of the talk posted online in the near future, and when that becomes available, you can be sure to find it here on Bruce’s official website. Of the video, he says “I want people to receive the gift Santa offers and then for them to share it.” So – stay tuned! 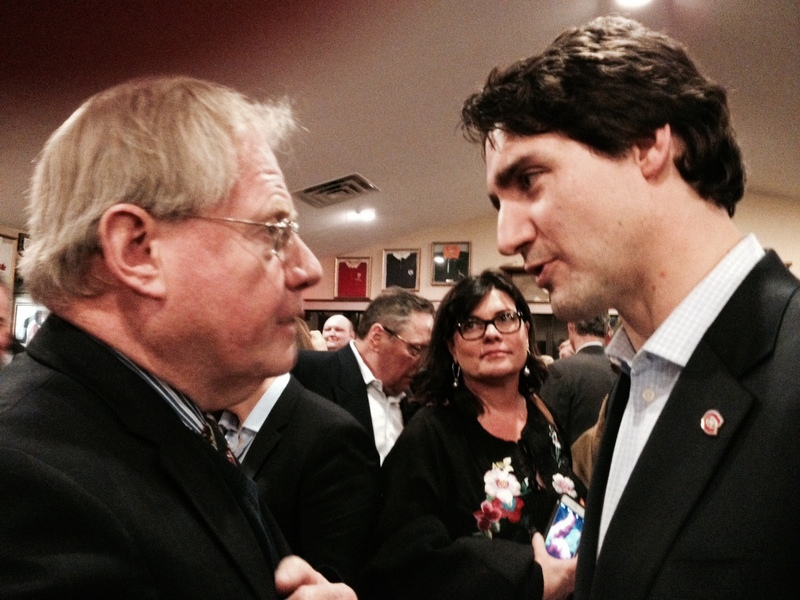 On his recent visit to St. John’s, NL to sign his own new book Common Ground, Justin Trudeau and Bruce Templeton had an opportunity to meet at a separate function. In their brief conversation, Bruce passed along a copy of The Man with the White Beard for Justin to take home to his wife Sophie to read! The Rotarian has included an article about The Man with the White Beard author Bruce Templeton in its recent December issue. Here is the copy from the magazine, sourced form the online version (which is here). Bruce Templeton, author of The Man with the White Beard and The Man in the Red Suit, was a guest on CTV Atlantic Morning today! If you weren’t up with the birds to catch the interview, fear not! You can click the screen grab below to watch it on the CTV website. Click above to launch the video.